There are many reasons why your home's heating system or furnace may not be working like it should (or working at all). Regular maintenance is important to prevent problems with your heating system and to keep your home comfortable and your energy costs low. Here at Precision Air, we can evaluate your current heating system and provide a fast quote to get your furnace running like new. We provide repair and maintenance services for oil, electric, gas, and propane furnaces. If your furnace is in need of repair, contact us today to request an inspection and quote! We offer free estimates on all our work in Nashville, Franklin, Murfreesboro and the nearby areas. Safety & efficiency. Maintenance and repair work performed by an experienced technician will enable you to avoid furnace problems. During the heating season, a malfunctioning furnace can be a very serious problem. Just because your furnace is functioning doesn't mean that it is working correctly, efficiently or even safely. We can provide furnace maintenance to prevent issues with your heating system and keep it running efficiently. Thermostat malfunction: An older thermostat can wear out or be damaged, which limits your control of the heating system. Upgrading to a programmable thermostat will solve this problem and also enable you to cut heating costs. Mechanical problems: The fan motor, drive belt and bearings in a typical furnace are all wear items. When these mechanical parts become worn, they must be replaced to avoid air flow problems or total system shutdown. Ignition problems: Most of today's furnaces have electronic ignition, so that the burner only turns on when the thermostat calls for heat. A clogged burner nozzle or a faulty ignition will prevent the burner from working correctly. Cracked heat exchanger: This furnace component separates the combustion process from the indoor air supply. With age, a heat exchanger can crack, which causes safety and performance problems. Improper venting: Any furnace that burns fuel requires an air supply for the combustion process, and a venting system to expel combustion gases. Your furnace technician will check for proper ventilation during regular service calls. Outdated, inefficient performance: Today's high-efficiency, sealed combustion furnaces can operate at 90% efficiency or better. Older furnaces may only reach 75% or 80% efficiency, even in perfect condition. Upgrading to an efficient, ENERGY STAR® furnace is a smart option in many cases. Leaky, uninsulated ductwork: Although ducts aren't part of the furnace, their condition has a huge impact on overall heating system performance. By sealing and insulating the ductwork system, you can improve system efficiency by 20% or more. If your furnace needs repair work, call the local experts at Precision Air. We provide complete solutions for all types of home heating needs. Our certified technicians will diagnose your system's problem and provide expert repairs regardless of the make or model of your furnace. Call us today at 1-844-386-0719 or contact us online to get started today with a free estimate! 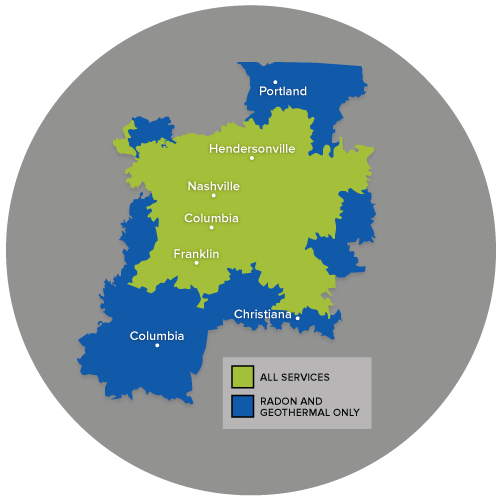 We offer expert furnace repair in Nashville, Franklin, Murfreesboro, Antioch, Hendersonville, Brentwood, Smyrna, Lascassas, Madison, Hermitage and throughout the surrounding areas.